about 4 weeks ago, we were headed to my mom’s house and this little dog shot across this busy street. so, we pulled off as quickly as we could to get it back to the other side where it came from. several cars passed going about 40mph or so. i was scared to deather that it was going to dart to the other side and get hit. then all of a sudden, there it went, back across bringing an oncoming car to a screeching halt. thank goodness the dog didn’t get hit. it kept on running, going through this very large hay field to a house down the way. jason and i ran across the field trying to catch the dog and see it’s collar. when i got to the house, i saw a lady let the dog in through the back door. i knocked on her door spoke with her for a little bit but she didn’t seem to care nor did she say thank you for any of our efforts or concern. that just disgusted me. if we hadn’t been there, that car would have hit the little guy. i was so mad at this woman! lock your gate lady, geez. when this happend, we had just moved back home from the bay area that week. people there are so prideful about their animals and are extremely aware of where they are and what they are doing at all times. i was so upset that anyone would be so careless and unaware about their pet. that was incident #1.
so moving on… we were leaving our condo and on the other side of the street was this small gray mangy dog sniffing in the grass. i thought maybe it was just being let out to go potty by it’s owner but there was no one in sight. so we pulled into the parking lot across from our condo. the dog was very skiddish and wouldn’t come to us. it had tags on but was very mangy, like it hadn’t had a bath in months. i assumed it was a lost dog and we were bound to find it’s owner. we found a little pile of old chicken wing bones in the parking lot (gross, i know… but it worked) and coaxed it over into a closed off area for a dumpster. finally, after about 30 minutes or so, jason got close enough to the dog to hold it still so he could see what was on the tags. we called the phone number (i was crying like a baby). a woman answered the phone and nonchalantly said, “yeah, that’s my dog. she’s such a bad dog. where are you?” she couldn’t have cared less, but i wasn’t too shocked considering how much she needed a bath. poor girl. the lady literally lived right around the corner from where we were. when she came she shook jason’s hand but that was it. i just don’t understand why people don’t take care of their animals! another lady that just had no pride in her sweet animal. the next incident was on our way home last week. we saw a cat in our parking lot that just wouldn’t move. i had to get out of the car to pick it up so that we could get by. it just rolled over like it wanted to play. (side note: i’m EXTREMELY allergic to cats, but in this moment, i didn’t care, i picked it up anyway). the cat had no collar but it was declawed so i knew it was a house cat. come to find out, thanks to one of our neighbors in our building, we found that it belongs to this guy down the street. so, i walked the cat over, he came out of his house when he saw me come into his gate. he didn’t really understand why we had his cat… “was she bad or something?” he said. obvisously, she wasn’t but she had gotten off his proprety and could have very well gotten hurt. i mean, if she rolled over in a parking lot, she surely wouldn’t have moved for an oncoming car. i put the cat down and within a few minutes she was crossing the street again. the owner just stood there and watched me while i went after her. again, a careless pet owner. arg. there were no tears this time, just anger. and i don’t even like cats! which, point proven, is why i don’t get one. last but not least was yesterday. i was driving down a major road here in nashville and there i saw a 40 pound dog walk very casually across the street a couple times right in front of me. thankfully cars are slowing down enough and the dog is getting across safely but i couldn’t help it. i had to stop. i got out, crossed the street to where the dog was and held it real tight to me. this was not a small dog, and she was strong as an ox. i noticed that there was a girl waiting at the bus stop. she yelled at me and said, “i know the owner. she’s my neighbor.” i told her (yes, i told her) to get her neighbor on the phone. i let her know that i had her dog and this is what she said to me… “do you want her?” i could have jumped through the phone! i said very sternly to her… “no, i don’t want her! i want YOU to want her! this is your dog ma’am. i want you to give me your address and your phone number and i will deliver her back to you.” so she did. i put the sweet doggie in my car and drove to her owner’s house. i knocked on the door (i knew that the girl i talked to was at work) and a young guy answered. i let him know that his dog was delivered safely to the back yard but he didn’t seem to care. it was all i could do to keep from taking the dog home with me but i knew i couldn’t. she was beautiful though and if i see her again, you better believe i’ll take her and find her a good and loving home. this was the most emotional one for me. i cried for the next hour over this. it just hit too close to me to see where this little baby was going to be living and then knowing that her owners don’t even want her. so, everyone listen up! if you think you want an animal, think you can handle the responsibility, think you can afford it or think that they are disposable beings, then DON’T GET A PET! stay away from those cute cuddly faces and bashful eyes that reel you in. it is not worth risking a life! evidently, the Lord knows just how much i love my animals, he has given me this task. again, i’m pretty sure this is a curse… but hopefully i can turn it into a blessing. so far, every animal has been delivered to it’s rightful owner. praise God for that! heat 2: shelby raced like a champ and got second place! yeah for our little speedy gonzales! last year she ran off into the crowd somewhere… i think a little munchkin was tempting her with an irresistible hot dog. it was a great day! 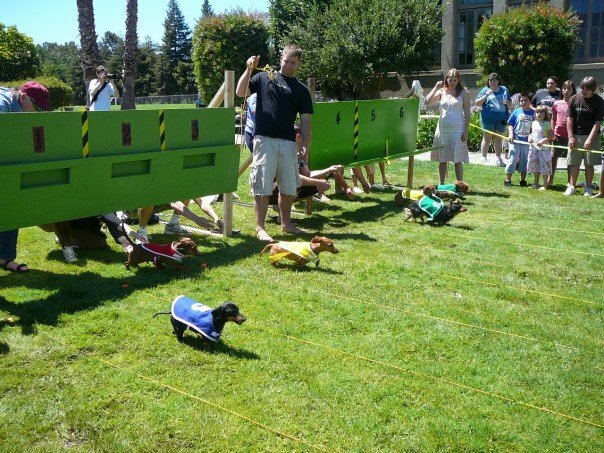 too short (no pun intended… get it… dachshunds are short… ha… ha… yeah, not funny), but it so much fun! here a few pictures to commemorate this year’s wiener nationals at highway. you know we had to get them a little treat for all their hard work! i mean, what kind of humans would we be if we didn’t? Is this what they mean by “two become one”? Seeing is believing! It’s easy to miss what’s right in front of you if you’re paying attention to something else. Thanks, Very Short List! Please pray for us! Our lease ends March 31st and we have no idea where we’re going to move to! We are looking for a house/condo/townhome to rent instead of an apartment. We’ve submitted 2 contracts already both of which have fallen through. Both of which were fantastic places! I hate to even talk about it but we may have to compromise and live in yet another corporate apartment complex. I hate the ‘C’ word when it comes to your living arrangements. ARG! So here’s the main issues – we HAVE to be close to the Caltrain so that Jason and/or I can ride it to get to work. We also have to have a place that takes both of our dogs. The last place that fell through was ONLY because the Home Owner’s Association only allows one pet to live there, which, honestly, is a bunch of poo. And of course, it’s got to be in our price range. Please please please pray for us. We’ve put in our 30 day notice and we have to be moved out at the end of the month and it sure would be nice if we knew where we’re going! Pray that God will literally open a door for us.